On March 7, 1997, the Pilgrim Nuclear Power Station near Plymouth, Massachusetts was shut down for refueling. All of the fuel from the reactor core had been offloaded into the spent fuel pool. A fault in the plant’s main transformer (T) caused it to experience “severe mechanical agitation” (the NRC’s phrase for something shaking like crazy or being beaten like a drum). 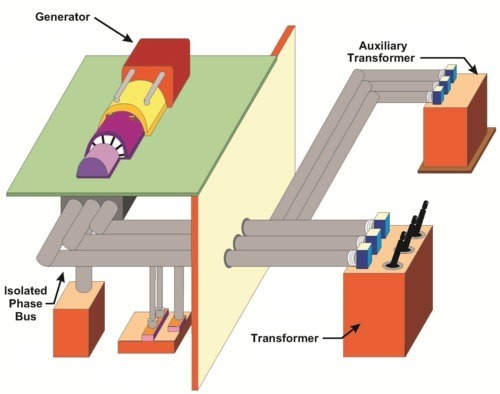 The main transformer was located in the plant yard area just outside the turbine building and was similar to the one shown in Figure 1. 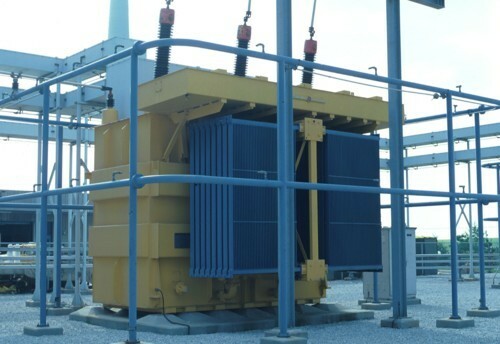 The main transformer fault caused the plant to lose all power coming from offsite. One of the two emergency diesel generators automatically started and supplied power to essential safety equipment. The other emergency diesel generator was out of service for maintenance at the time. The oil flowed under the doors in the turbine building to the “A” essential-switchgear room. The essential-switchgear room contains dozens of electrical breakers for motor-operated pumps, valves, fans, and other equipment. Some of the oil spilled down a stairwell and pooled around the radwaste holdup tanks and the instrument air compressors. The flash point of the oil was 275°F. The oil did not catch fire although the potential was there given the heat from energized electrical equipment and the operating air compressor. The NRC determined that had the oil ignited, the fire in the “A” essential-switchgear room could have disabled all safety equipment powered from it. It also determined that the smoke and hot gases could have entered the “B” essential-switchgear room through the ventilation wall opening between the adjacent rooms and disabled all safety equipment powered from it. That would have disabled all electrical equipment at the plant except for that which was battery powered. In other words, Pilgrim was a spark away from experiencing the loss of all in-plant ac electrical power – an event called a “station blackout” in the industry. During a station blackout, the only electricity available is dc power from batteries. The batteries can power emergency lighting and an absolute minimal set of essential valves and controls for up to 4 hours. During that time, workers must either get at least one emergency diesel generator up and running or re-connect the plant to the electrical grid. Otherwise, the meltdown clock starts when the batteries stop. One of my last jobs in the nuclear industry before joining UCS was to develop the licensing bases topical report on station blackout for the Connecticut Yankee nuclear plant in the summer of 1996. At that time, all the nuclear plants in Connecticut were shut down due to design and licensing bases non-compliance issues (e.g., the Millstone debacle). John was right. A problem with a transformer out in the backyard at Pilgrim is not supposed to pose a challenge to either division of in-plant ac electrical power. But a flawed design allowed flammable oil to leak toward safety equipment instead of away from it. Good luck prevailed over bad design at Pilgrim this time. But the more often one relies on good luck instead of good design increases the chances that luck runs out and bad headlines prevail over formerly good luck.